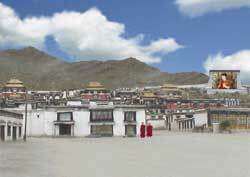 Tashilumpo Monastery is the seat of the sizeable Panchen Lama sect, Tibetan Buddhism's second leading religious group. The monastery is an interesting sprawling amalgam of traditional Tibetan monastic style halls, chapels and other structures connected by precipitous steps and narrow cobblestone alleys. The interplay between Tashilumpo's golden roofs and its white, red and black exterior walls creates a striking composition. The gilded, bejeweled and immense sculpture of the seated Maitreya (future) Buddha is one of the monastery's major draws. Several thousand monks once inhabited Tashilumpo. Today, the number is considerably smaller.